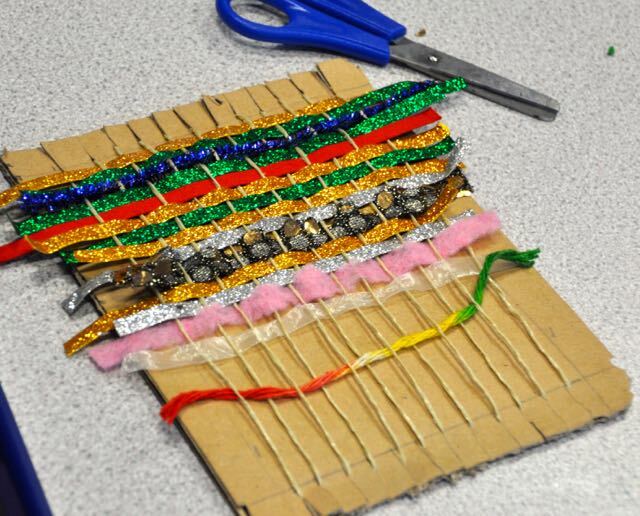 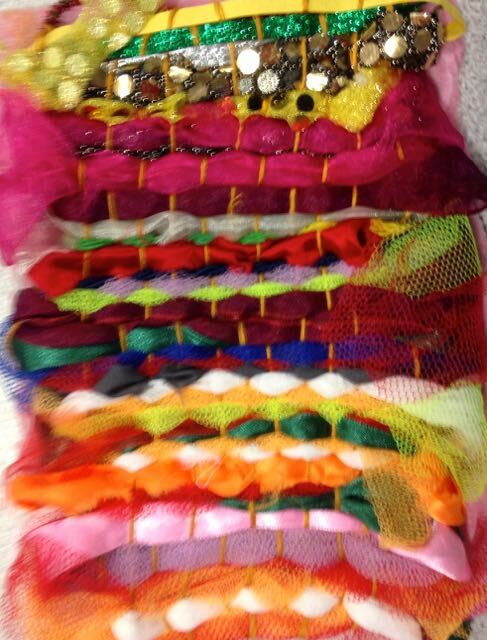 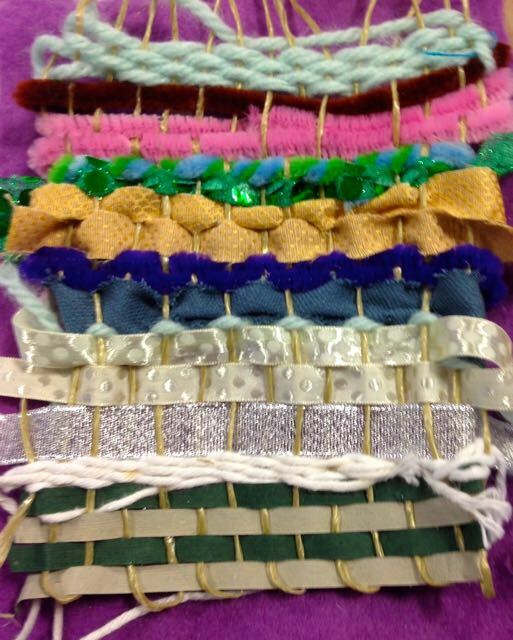 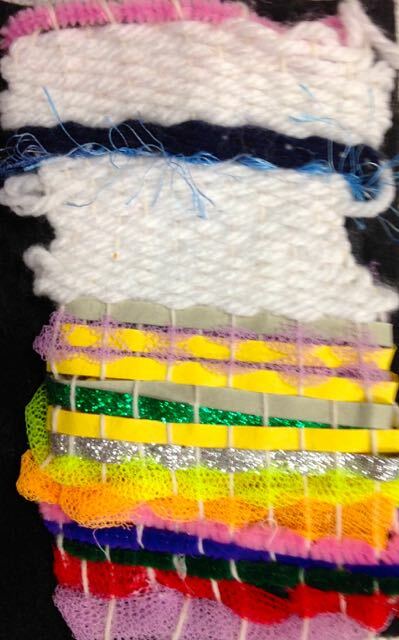 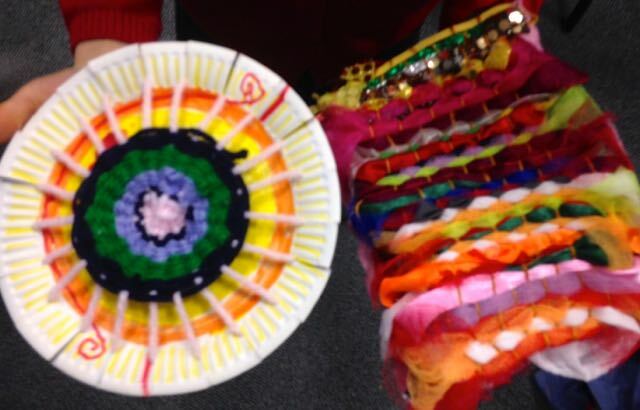 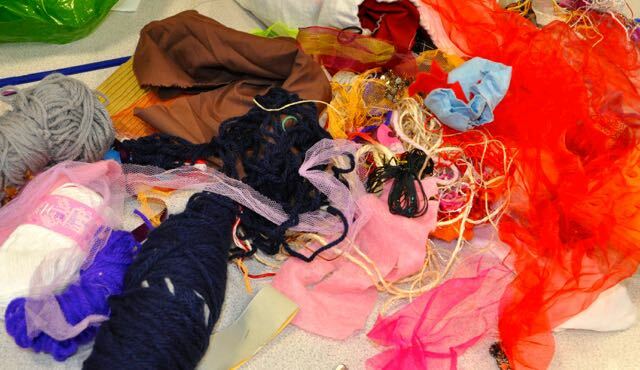 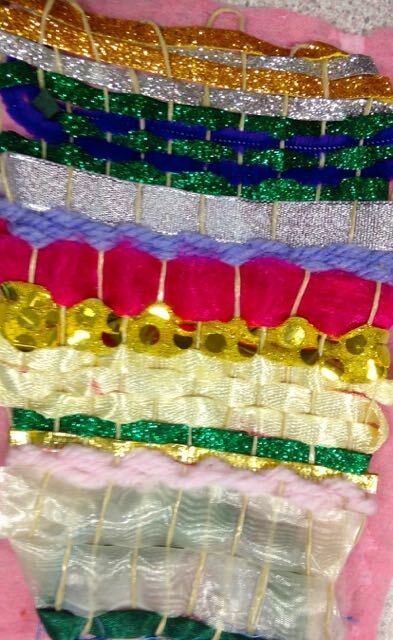 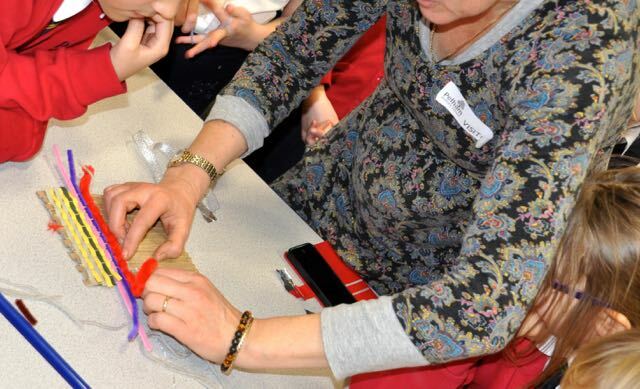 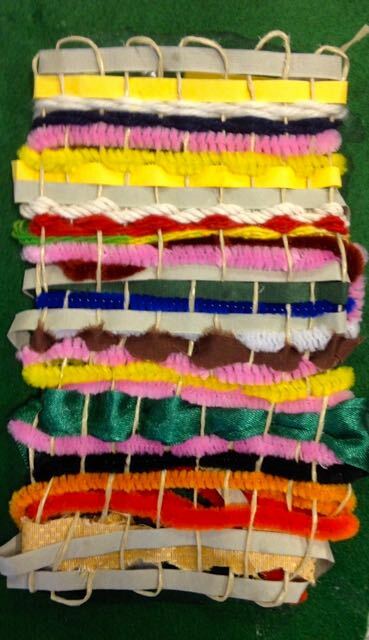 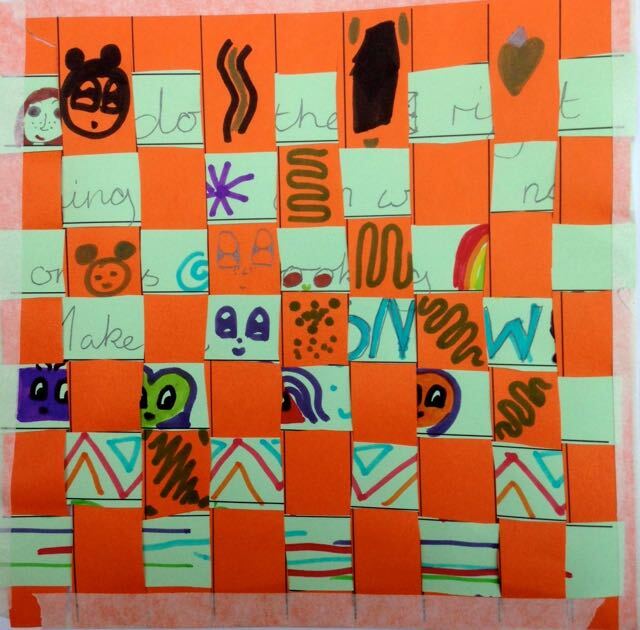 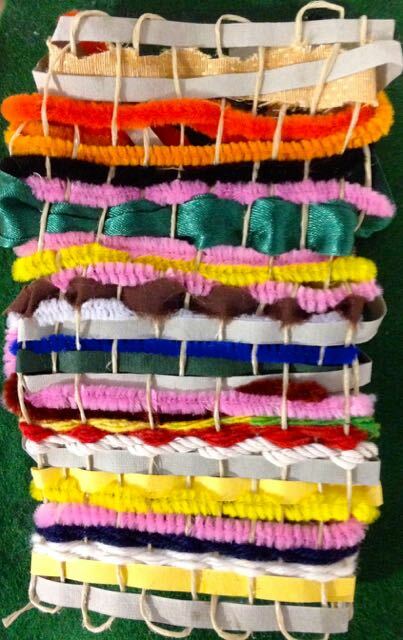 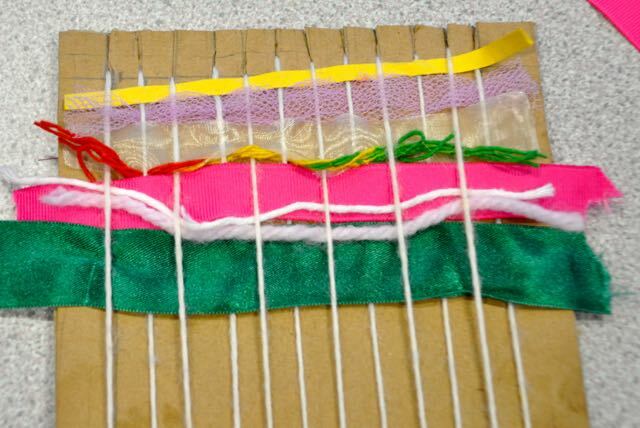 At Pelham after school art club this half term children have been learning about weaving with artist Veena Scialo. 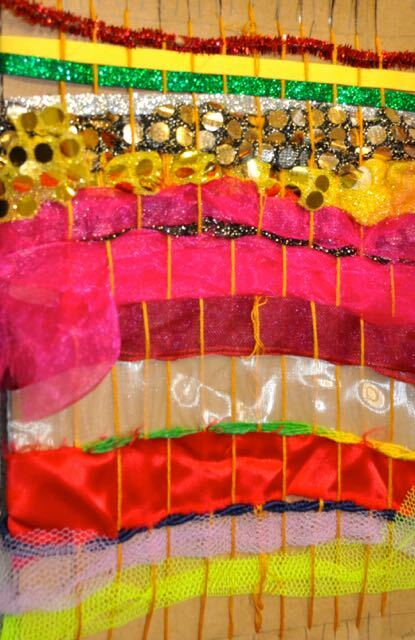 Tapestry is an art form used throughout the ages to tell stories, and decorate the homes of the rich and powerful. 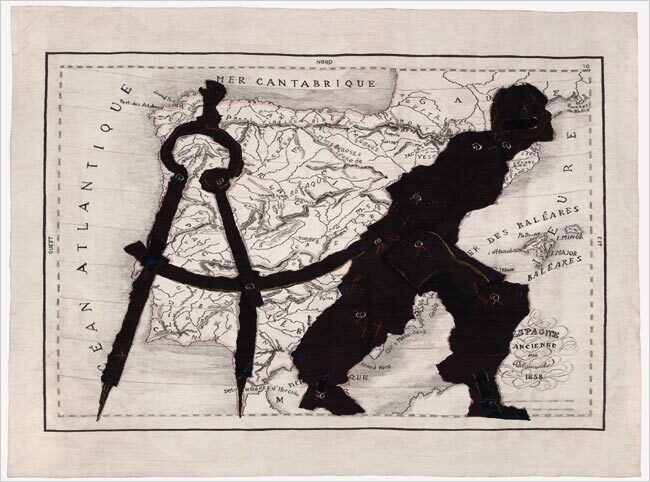 Many contemporary artists like Grayson Perry and William Kentridge use this traditional craft technique to convey equally powerful messages for a modern audience. 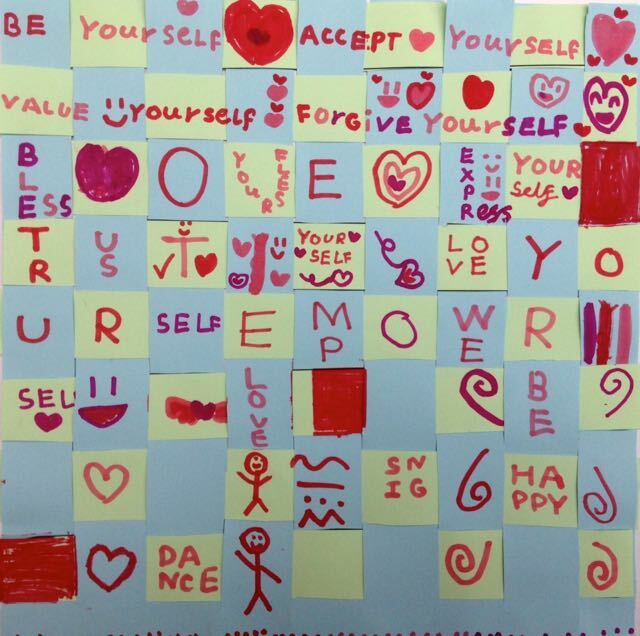 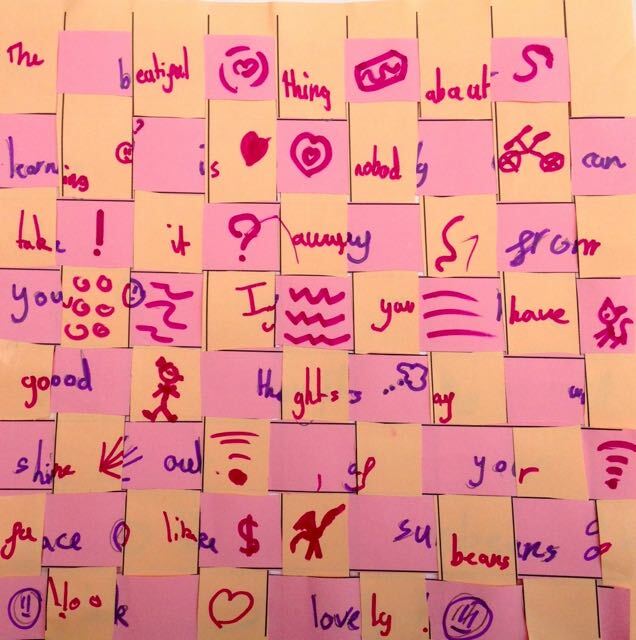 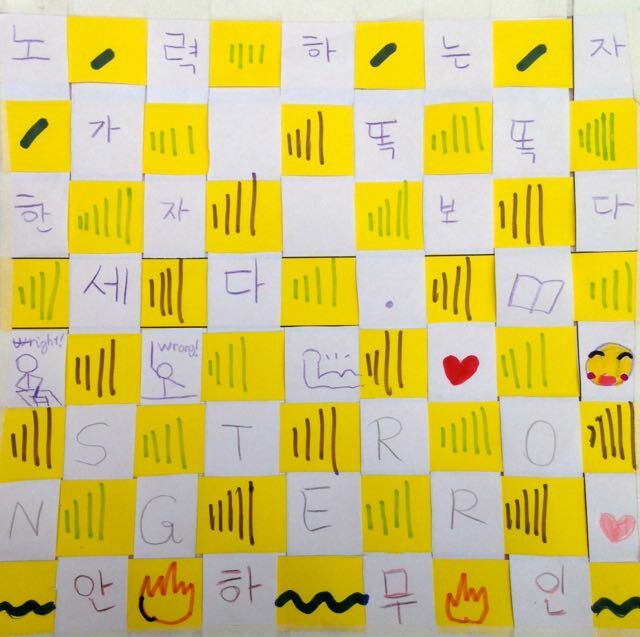 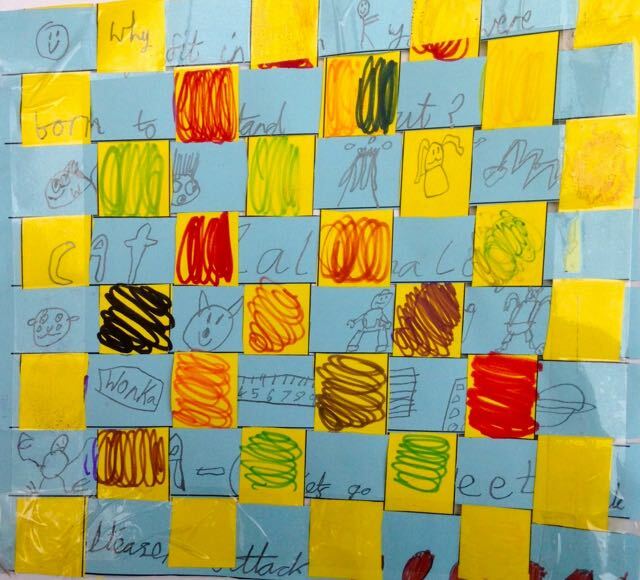 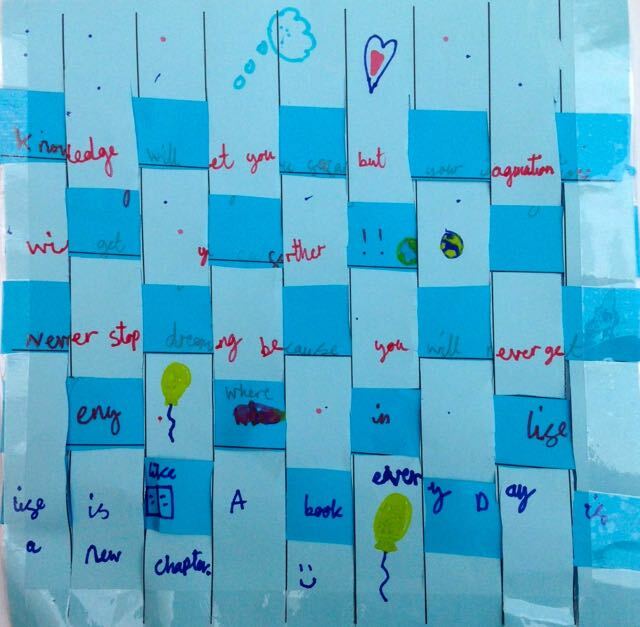 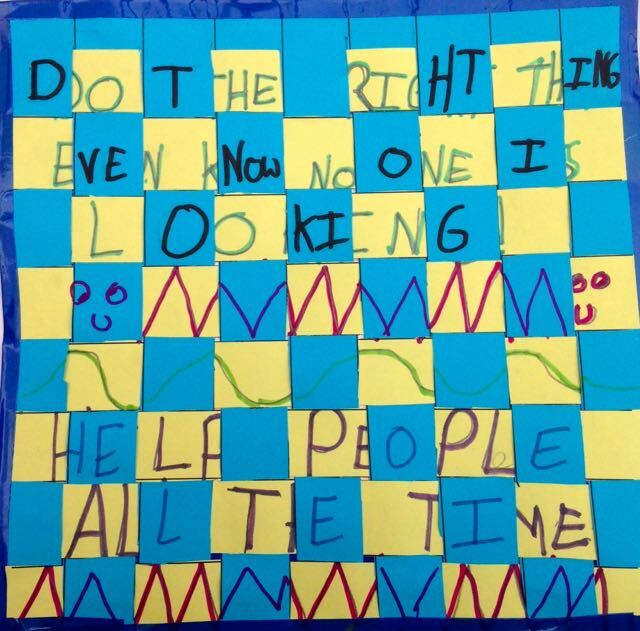 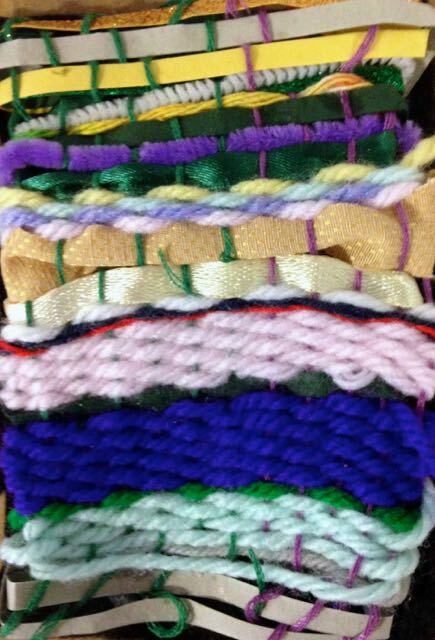 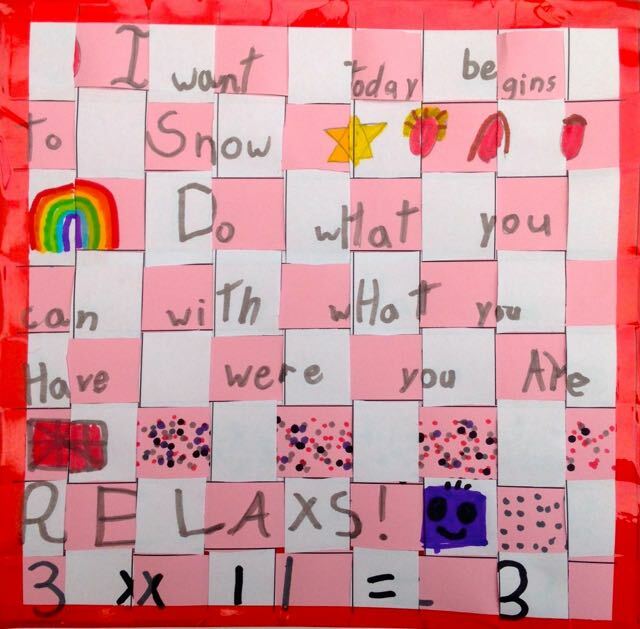 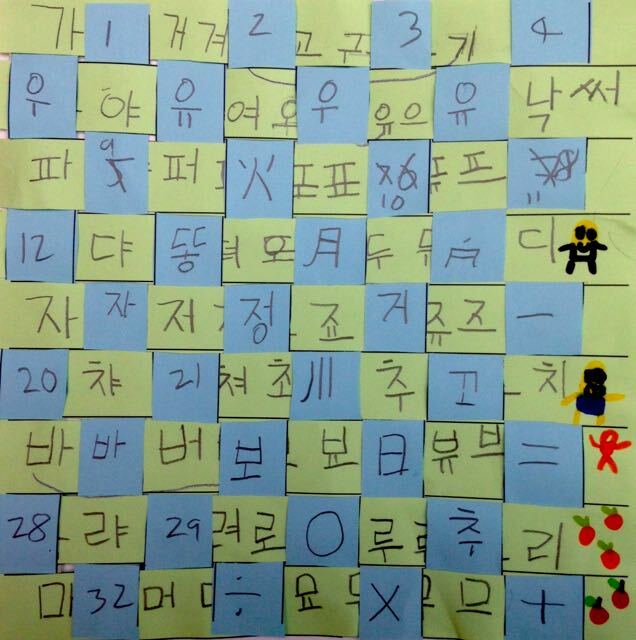 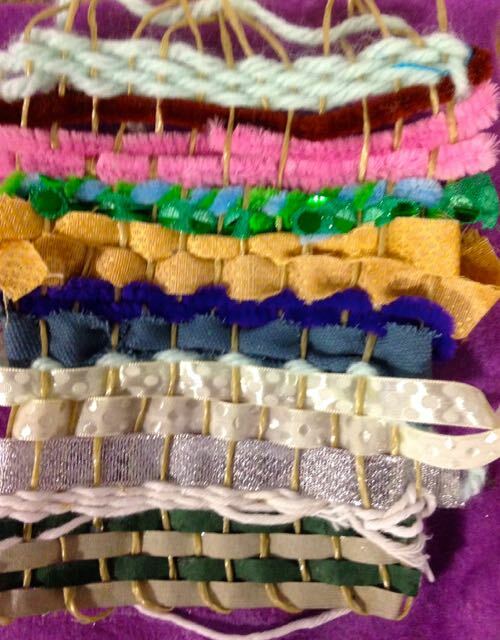 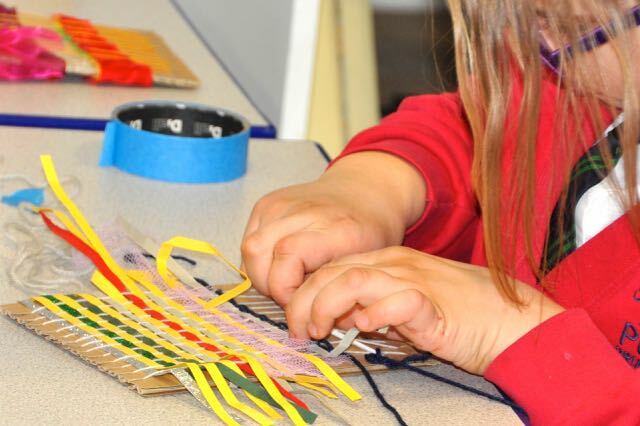 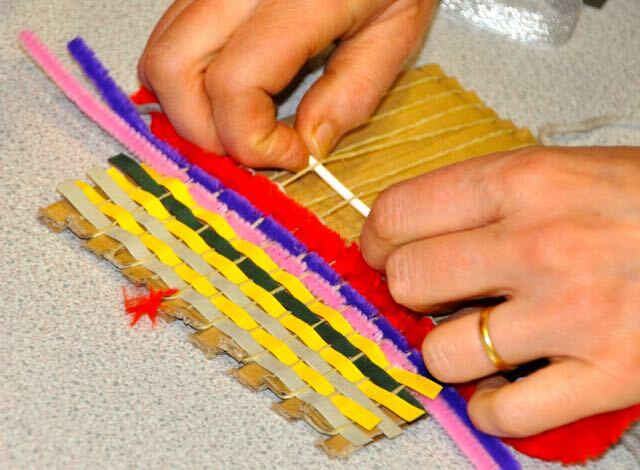 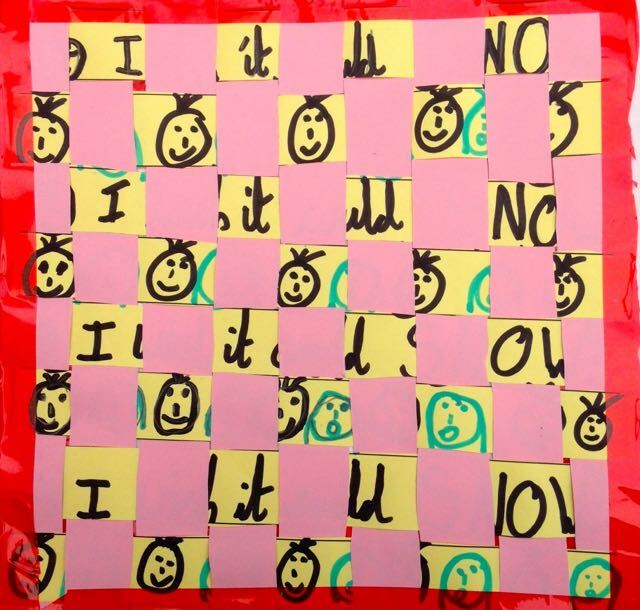 Children began by experimenting with paper and weaving a simple message onto the warp and weft strips. 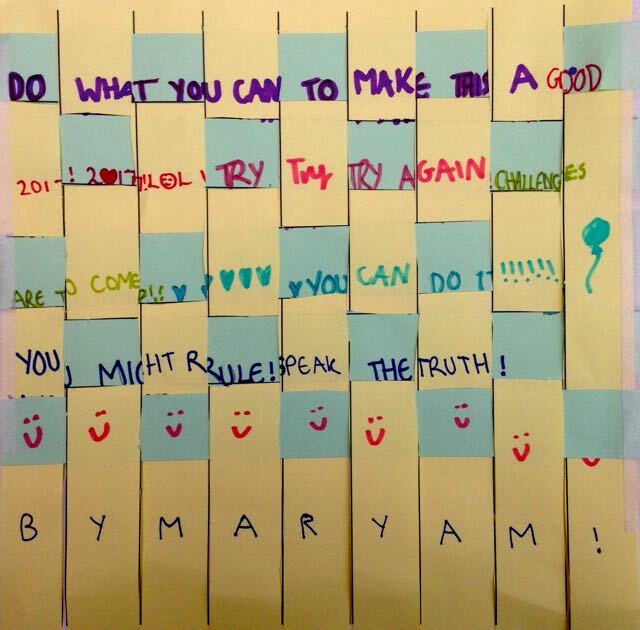 I think these images are quite powerful. 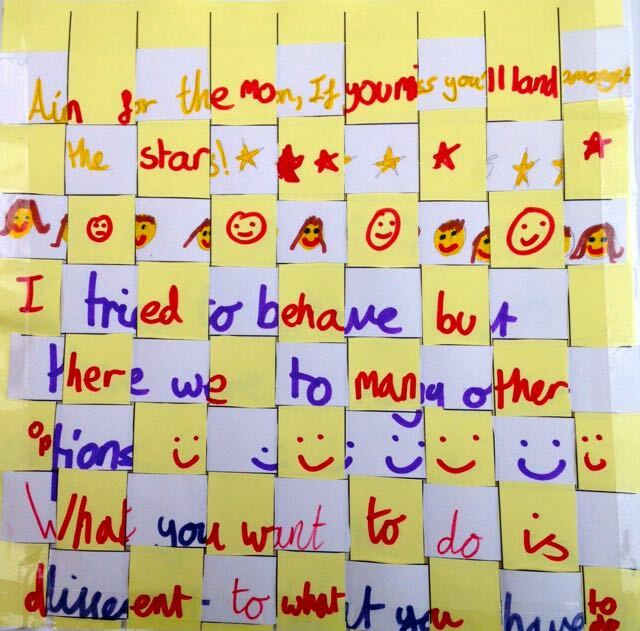 The children share with us different ideas, beliefs and languages. 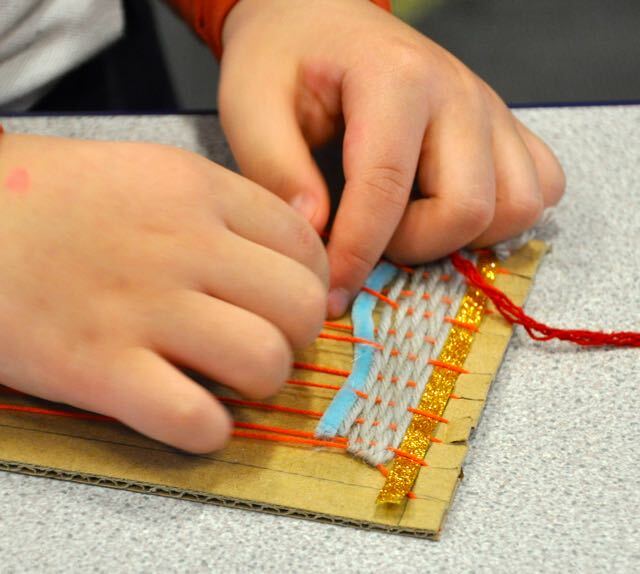 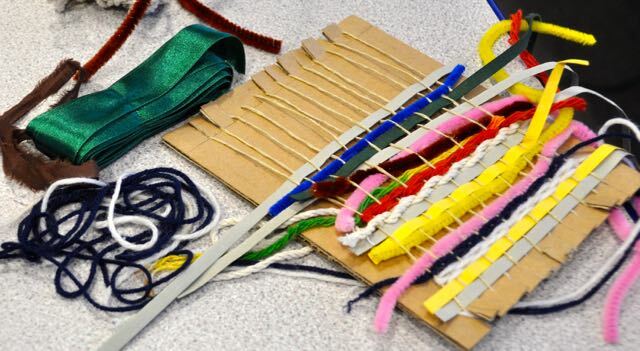 They learned how to make a simple cardboard looms and started weaving using a range of yarns, fabric and decorative strips we found in our materials boxes. 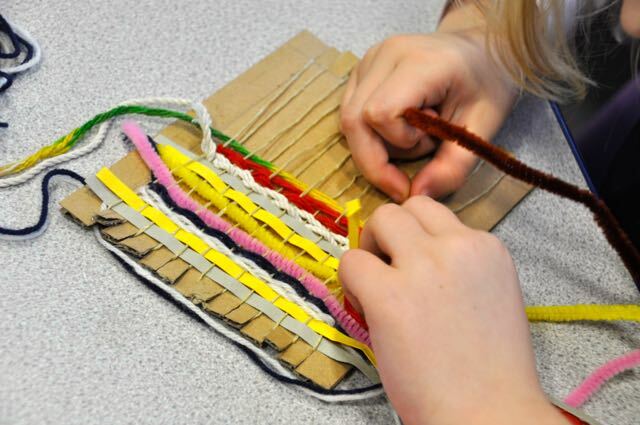 Great work for little fingers, fine motor skills and hand – eye coordination. 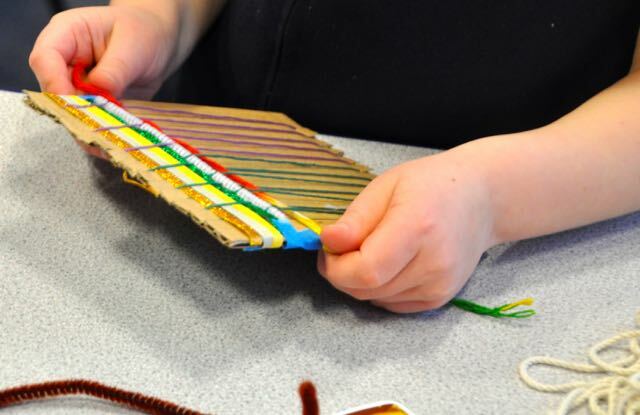 It took a little while and several demonstrations to get the measuring and the required lines on the cardboard right but children learned valuable skills to make their own looms from recycling materials like cardboard boxes and gift ribbons. 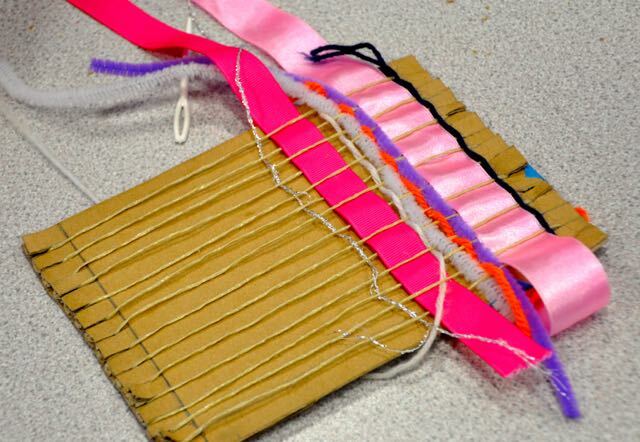 This was used to talk about waste and recycling which we hope to develop in a bigger piece with the whole group. 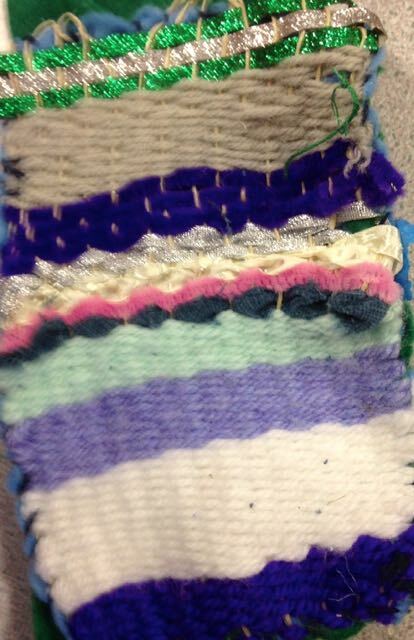 Hope you like the finished mini carpets. 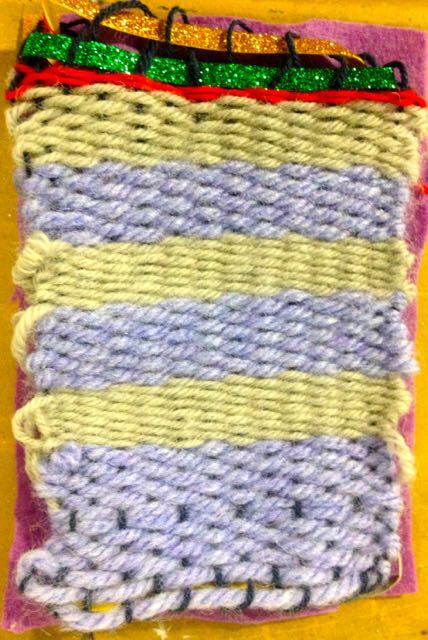 They were mounted on a piece of felt and some managed to stitch the fabrics together to make a little bag. 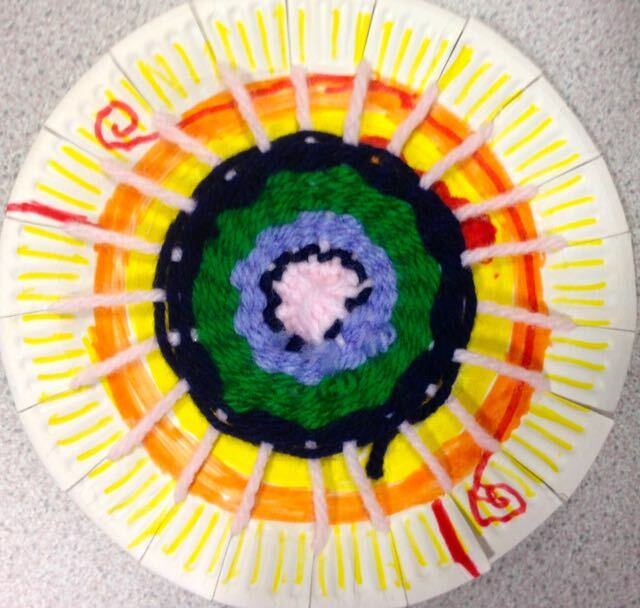 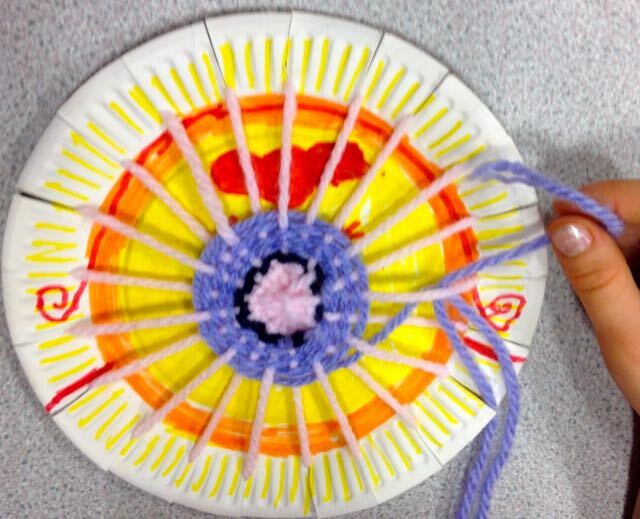 Some began to do some circle weaving to create a different effect.